Threshold securities listed for every settlement day. As the founder of the U.S. equity markets the New York Stock Exchange has a centuries-long commitment to providing orderly, transparent capital markets. Today, this principle remains central in our work in bringing companies to market and ensuring robust, liquid markets for secondary trading. 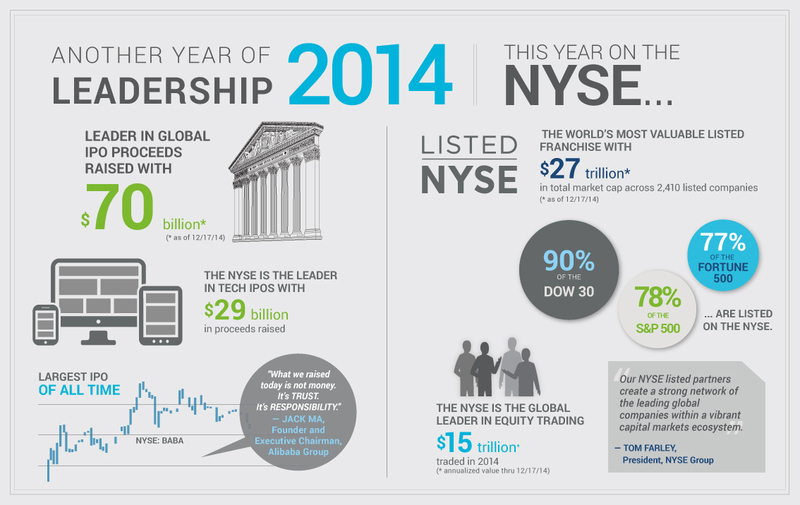 NYSE-Listed companies enjoy a host of benefits including our unique market model, innovative visibility opportunities, and cutting-edge technology solutions. These advantages have attracted many of the world’s leading companies year after year, and 2014 was no exception. 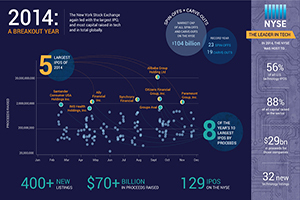 For the fourth year in a row, NYSE led in capital raised at more than $70 billion, and for the third year in a row led in tech IPOs with $29 billion in proceeds. Today, NYSE-Listed companies account for $27 trillion in market capitalization, representing the most valuable listed franchise in the world. The IPO provides a well-documented range of advantages to companies, employees and economies, including access to capital, job creation, employee retention and brand elevation. And this can fuel innovation, growth and greater competitiveness. And because the relationship only begins on the day of listing, the NYSE is taking a leadership role in helping simplify market structure and increase market confidence. We unilaterally began streamlining order types to reduce complexity and we’ll continue to be advocate on behalf of listed companies. © Copyright 2019 Intercontinental Exchange, Inc.